A community paralyzed with fear, not knowing when an unseen presence will claim its next victim. Are we describing an epidemic or a supernatural predator? The similarity is not a coincidence in the horror story, The Legend of Sleepy Hollow, whose author, Washington Irving, fled a yellow fever outbreak in New York. Writing in Smithsonian magazine, Elizabeth Bradley, an editor of several of Irving's works, describes how disease—and the panic it creates—inspired the writer of one America's most haunting and enduring short stories. Irving, a native of New York City, made his first trip upstate to Tarrytown in 1798, when he was 15-years-old, to stay with his friend, James Kirke Paulding. Irving left the city during an outbreak of yellow fever, which had killed 5,000 people in Philadelphia and was expected to have a similar death toll in New York. These epidemics fueled racial prejudice and xenophobia. Fingers of blame were pointed at West Indian refugees, foreign sailors and shipments of rotten coffee. Families, such as Irving's, who had enough money, fled the miasma of the cities for the pure air of the countryside. The story's narrator, a Dutch historian named Diedrich Knickerbocker, describes the "sequestered glen" of Sleepy Hollow as a place with "contagion in the very air… it breathed forth an atmosphere of dreams and fancies infecting all the land." Natives and newcomers alike were susceptible to this airborne infection, which caused them "to walk in a continual reverie." Their somnambulance is "unconsciously imbibed by anyone who resides there for a time…however wide awake they may have been before they entered that sleepy region[.]" Ichabod Crane, who is himself a "newcomer," is described as being far and away the most afflicted by this "visionary propensity"; he is addicted to scary stories and trades anecdotes out of Cotton Mather's History of New England Witchcraft for the haunted local histories told by his Dutch hosts. The "pleasure in all this," the narrator Knickerbocker warns, "…was dearly purchased by the terrors of his subsequent walk homewards." In Irving's Sleepy Hollow the Dutch community can "vegetate," to use Knickerbocker's word—or better still, incubate—nurturing its visions and "twilight superstitions" without the interference of history. The town's collective sickness has made it into a time capsule—each day, nothing changes; each night, the Horseman comes. But the ending of "The Legend of Sleepy Hollow" offers a kind of vaccination: a way to leave contagion behind – and superstition, too. After attempting to court a local heiress, unlucky Ichabod is chased down by the headless Hessian (or believes he is), and vanishes in the night, leaving only his horse and a smashed pumpkin behind. 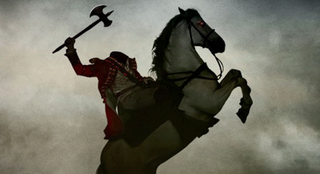 In truth, it's not the Horseman or the [possible] hoax that we should fear, but the contagion that grips Sleepy Hollow. Ichabod's flight, far from being an act of cowardice, gave him back his life. It would not be the last time that an epidemic in the U.S. was the inspiration for supernatural horror. In the late 1800s, a tuberculosis outbreak prompted a vampire panic that swept across New England. Paul Barber, a folklorist who has studied the incident, argues that the seemingly bizarre vampire beliefs get at the essence of contagion: the insight that illness begets illness, and death, death. Vampire believers "say that death comes to us from invisible agents," Barber says. "We say that death comes to us from invisible agents. The difference is that [today] we can get out a microscope and look at the agents."